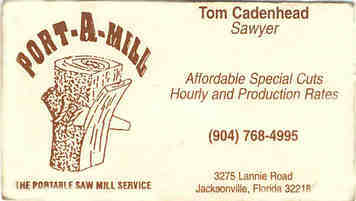 Tom's Saw is a portable (custom sawing service that travels within a 50 mile range of Jacksonville, Florida's International Airport. You are within touch if you are in St. Mary's Ga., Folkston, Ga., St. George, Ga., Moniac, Ga., McClenny, Fl., Middleburg, Fl. or western reaches of St. Augustine. Special requests may find me further out. $200 per thousand board feet with a 500 foot minimum. I bring the saw and operate it. You provide the labor of log handling and off-loading the mill. (There must be ample room for the mill, logs, lumber, tailings, egress to and from the site)I will be happy to come look at the site. Logs must be ramped before-hand by laying them on two runners (small saplings or two logs set about 6' apart). The mill has a hydraulic lift that will place the log on the mill. When I leave, you will have a pile of sawdust, a pile of slabs and a stack of lumber.